Called the “Crown of the Continent” by early enthusiasts, Glacier National Park has been a destination for nature lovers since the earliest days of the National Park Service. In olden times, visitors would travel by rail, then make a multi-day trip on horseback just to witness the region’s dramatic landscape of age-old peaks, pristine boreal forests and alpine lakes. From the 1910s, they were met with the rustic comfort of Swiss-style chalets, now counted among the park’s historic landmarks. Climate change means that there are fewer glaciers in Glacier National Park than there once were, but that doesn’t mean that winters there are especially mild. In fact, deep snows often close sections of the park’s main artery, Going-to-the-Sun Road, during winter months. But just because the road’s partially closed doesn’t mean that the park is dormant — quite to the contrary. Winter activities at Glacier National Park include some of the best snowshoeing and cross-country skiing in the region. Summer months open the park’s famous backcountry, which is home to more than 700 miles of hiking trails, to travelers from near and far. 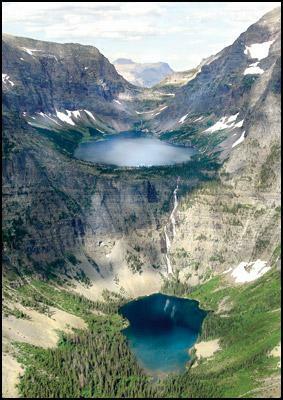 Vistors from neighboring Waterton Lakes National Park can cross into Glacier at Goat Haunt – the two parks together constitute the world’s first International Peace Park, founded 1932. Far-flung regions like Two Medicine and Many Glacier beckon to adventurers in search of pristine wilderness and unparalleled wildlife viewing opportunities. But you don’t have to trek too far off the beaten path to take in the park’s resplendent beauty. Ample visitor services make exploring Glacier National Park easy: Boat tours explore lakes, rangers guide hikes, and shuttle buses provide acces to Sun Road’s many attractions. Click to see a detailed Glacier National Park map.